I know it’s still summer, but with two kids under two I’ve been trying to cook extra on the weekends and coast on the weekdays. This past weekend I made beef stew and pulled pork sandwiches in the slow cooker, and they turned out pretty good. 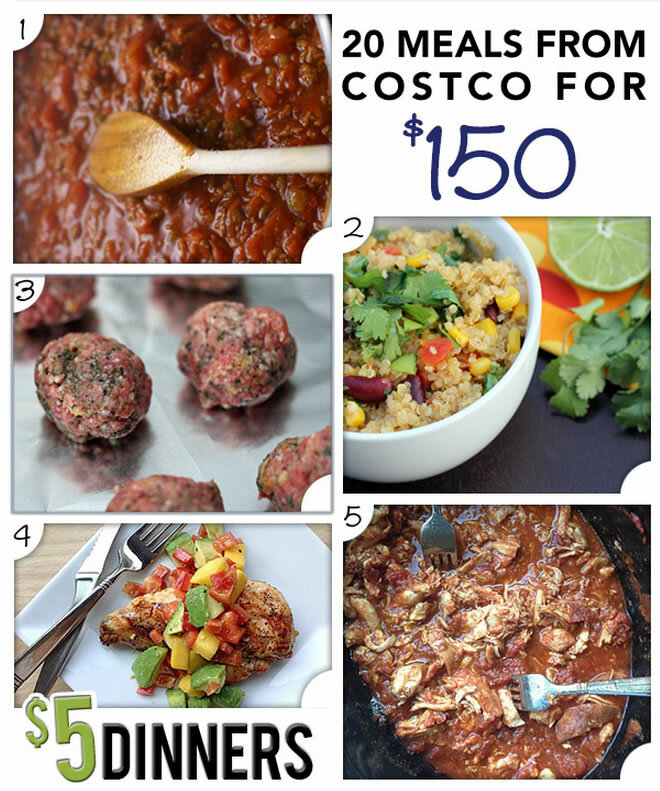 Today I found 5dollardinners.com (from my wife’s Pinterest or Facebook), which shows you how to make 20 slow cooker meals for $150 using Costco’s bulk food packages (this version is gluten-free too). Basically, you go to Costco and buy exactly what is on the provided shopping list (6 pack of chicken breasts, 15 lb bag of potatoes, massive tub of BBQ sauce, etc) and then chop and separate all the ingredients into 20 separate freezer bags. When you need an easy cheap meal, pop a bag into your slow cooker in the morning and you’ll have dinner ready by the time you’re done with work. You’ll need a slow cooker with a timer if you don’t work from home. You can piece together all the info on the site for free, or for $5 you get some nicely organized instructions and even bag labels. That makes this site a cool entrepreneurial example as well. Costco is already a great place for people who don’t want to shop for extreme bargains, they just want a decent deal with no hassle. Why not extend the idea to meal planning. The creator definitely put in work to save you time, so why not compensate her for it? They also have two other Costco meal plans that are not 100% slow-cooker specific. With every ingredient having to go into more than one recipe, you’d worry about too many similar meals but the variety of the recipes actually looks pretty good. I haven’t actually cooked any of them myself, however. If I was really motivated I would try and make something similar for my own personal tastes. Wouldn’t these be $7.50 each? According to the site FAQ, their namesake $5 dinners are usually enabled by grocery couponing. Costco doesn’t accept manufacturer coupons, doubling, tripling, etc. I don’t like to spend time looking for and tracking coupons myself, I like minimizing my shopping time as much as possible so Costco works well for me. I agree with you about Costco. It isn’t for “extreme bargains”, but they definitely have quality at lower prices and have developed peoples trust at curating products for them. I think people also need to step back and think about the quality of food they are eating and it’s long-term effects, not just the price/quantity. Americans are spending less and less on food, and more and more on health care. It’s no secret that our diet of high-cholesterol, high-sugar, high-salt foods that are low on fiber is causing major health issues. These Costco meals seem overly dependent on meat, which contain no fiber. Plus, animal products are the only source of cholesterol in food (plants have none!). So with these meals, you might be saving a few bucks in the short-term, but the long-term health effects can be disastrous. And if you care about the environment or animals, these meat-heavy meals are also creating horrendous consequences in those regards as well. True, all the meals do probably include more animal protein that is healthy or necessary. That may be a customer-driven thing, or it might just be what the creator likes to eat. But preparing your own food from scratch at home is still much better than buying it processed and pre-made or eating out everyday. Not too hard to adapt the recipes for more veggies/legumes and less meat. @Millennial Finances, I agree with Johnathan Ping. While it is true that these are not the best–they are a great start, and MUCH better than the junk we can easily order. I watch the sunset while i am at work if that tells you how early i am out the door. and by the time im home, and done with my homework (because i am also a student) i am beat. its hard to take time to cook a healthy home cooked meal when your tired. I am committing myself to feeding my family all homecooked meals *EVERYTHING HOMEMADE* this year. so these are a great option to turn to (though i am making some adaptations (ie. making my own bbq sauce, using healthier ingredients, adding in extra veges, and using fresh diced tomatos ect) these are great to be able to pull out of the freezer when i honestly dont want to bother. This is Millennial Finances responding. I agree, making anything at home is almost always going to be better than eating the same meal at a commercial restaurant. Cooking is a really important, undervalued skill that I hope more people embrace. However, I’d still say that it’s not more time-consuming or difficult to cook 100% plant-based meals that are healthier and better for the environment. It’s also cheaper- lentils/beans/eggplants/etc. are cheaper than chicken/beef and easier to cook (no worries about undercooked veggies poisoning anyone!). If you want to save money and eat healthier – people should cook more. If they want to be REALLY healthy and REALLY save money – they should look into cooking vegetarian.